Nepal is one of the richest countries in the world in terms of natural beauty due to its unique. The elevation of the country ranges from 60m above sea all within a distance of 150km with climatic conditions ranging from sub tropical to arctic. The wild variation fosters an incredible variety of ecosystems, the greatest mountain range on earth, thick tropical jungles teeming with a wealth of wildlife, thundering rivers, forested hills and frozen valleys. Within this spectacular geography are some of the richest cultures of Himalayan heritage. Nepal, home of Mt Everest, is also home of some 23.1millon people belonging to 101 ethnic groups who speak over 92 different languages, most living rural lives in their own little worlds, along the length of the Himalayas. The best way to explore The exotic Himalayan nature and culture of Nepal is by walking through these village and meeting the charming people, as the great Swiss Geologist Tony Hagen did in the 1950s, before Nepal even opened its doors to the outside world. We invite you to: meet the lovely people of rural Nepal, share a meal with them, stay at their house as family guests, taste their local drink and see them carry on with life graciously. In addition, to the heartwarming hospitality, you will also witness some of the most spectacular views of the mountain landscapes or heritage sites along the way. visit rural Nepal to know the real Nepal visit to this rural parts of Nepal, not only takes you through pristine landscapes and colorful mountain cultures, but it also gives you a chance to educate and empower the local community and be a part of their development process. Money spent in these areas contributes directly to the local livelihood. In the 1950s, Nepal opened its doors to tourists, and has received millions of visitors since then. However, much of Nepal is still the Shangri-La that travelers long to experience. Therefore, with the aim of showing new area and promoting and developing indigenous people and culture, a new approach to tourism, based on sustainable development has initiated by Nepal. Community-based tourism is also being initiated in other parts of South Asia as a tool for sustainable development. In Nepal rural tourism has been pioneered by Tourism for Rural Poverty Alleviation programme(UNDP/TRPAP) aiming to help alleviate poverty through sustainable and responsible tourism. We are pleased to extend our warm hospitality and hope your stay in Nepal is a memorable one. If you have any queries or comments, please feel free to contact us at the Nepal Tourism Board. We recommend that tourists avail services from registered agencies only. 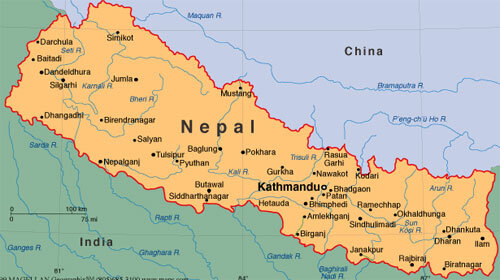 Nepal is situated between the great civilisations of India and Tibet. A landlocked country it has some of the most diverse topography in the world, rising from almost sea level in the south to the highest point on earth within a distance of less than two hundred kms. A land extremely rich in exotic vegetation, the hills are covered with huge numbers of plants, flowers and trees. Pleasant rural villages are linked by paths and ancient trade routes through paddy fields, forested hills, alpine meadows up to yak pastures and mountain moraine. Latitude : 260 12’ and 300 27’ North. Longitude : 800 4’ and 880 12’ East. Vegetation : Nepal possesses some of the most outstanding biodiversity in the world, ranging from sub-tropical rain forests to alpine terrain. Time : GMT+ 5 and 3 quarter hrs. Major trading Nations: India, U.S.A., Germany, China, UAE, Singapore. Industries : Tourism, carpet, textile, rice, jute, sugar, oilseed mills, cigarette production, cement and brick production. National Bird : Impean Pheasant. National Flower : Rhododendron (Arboretum). London time : 5 hours 45 minutes. Sydney time : - 3 hours 15 minutes. Hawai Time : + 15 hours 45 minutes. Tokyo Time : - 2 hours 15 minutes. New Delhi Time : + 15 minutes. 1. 32 different varieties of Rhododendrons. 2. 7500 different types of plants and vegetation. 3. 61 Ethnic groups & over 70 spoken languages. 4. Land distribution; essentially three divides Terrai (South) 17%. Middle hills 68% The Himalaya 15%. Lowest level 57.3m highest point 8848m. 5. Highest point on earth Mt. Everest 8848m. 6. 8 mountains above 8000m in height. 7. 47 mountains above 7000m in height. 8. 156 mountains above than 6000m in height. 9. World's deepest gorge Kali Gandaki. 10. 81% of people live off the land. 11. Some of the world's best white water rafting, Kaligandaki & Sunkoshi (River of Gold). 12. The finest trekking in the world with numerous treks including: Trans Himalayan (Annapurna).Everest (Solu Khumbu) and The Langtang Valley. 13. The only habitat of the famous One-Horn Rhino. 15. Worlds highest Lake (Tilicho (5200m). 16. The Greater Himalaya dates back over 70,000,000 years. 17. The deepest valley trekking in the world (Arun Valley Trek). 18. World's highest pass (Lugula Pass, Manang 6723m). 19. Nepal covers 0.1% of the worlds landmass yet contains 2% of the world's flowering plants and over 8% of the Worlds bird species, with 848 species recorded to date.319 species of exotic orchids have been discovered.